Originally built by Magnus Poulsson during World War I, Lysebu Hotel was used as a personal residence for Norwegian ship owner Anton Fredrik Kaveness. After the World War II, Lysebu was donated to The Danish-Norwegian Cooperation Fund in appreciation of the food aid Norway received from Denmark during German occupation. The Fund’s mission is to spread awareness and promote cultural dialog between Denmark and Norway. Today, Lysebu remains owned and operated by The Fund and income generated by the property supports the organization’s mission. 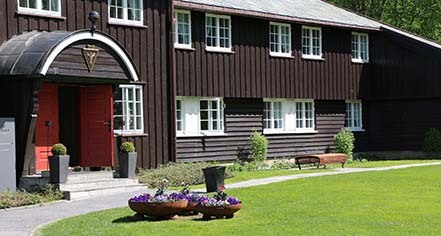 Surrounded by 300-year-old fir trees at the gateway to Norway’s treasured forested region, Nordmarka, Lysebu offers 86 guestrooms, many with breathtaking views of the Sørkedalen valley and the Norefjell mountains. 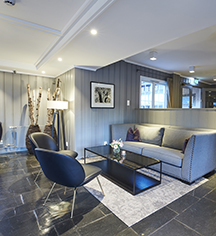 Because of the strict preservation laws, the hotel has the unique advantage of being one of the few properties in Nordmarka. Outdoor enthusiasts can easily access skiing and hiking trails from Lysebu, while guests preferring indoor activities can enjoy the hotel’ s fine restaurants, swimming pool, fitness center, and on-going cultural events hosted by The Fund. The natural wonders neighboring Lysebu evoke the ambiance of an intimate vacation without sacrificing modern comforts. Lysebu was gifted to the Foundation for Danish-Norwegian Cooperation as a thanks for the relief aid provided by Denmark during WWII. Cribs and Pack-in-Plays: Available upon request; NOK 170 per night. Rollaways: Available upon request; NOK 380 per night. Learn more about the History of Lysebu .